If you're looking for the best angle grinder, the chances are you are fairly deep into some pretty serious DIY or hobby work. These rotating discs of fury are largely used to slice through metal surfaces, clean up welds and slowly make mincemeat out of rusted on bolts and other irksome metallic objects, via the powerful gift of abrasion. A variety of grinding wheel accessories mean these handheld tools can take on numerous tasks, from polishing rusty surfaces to cutting through iron rods, but it is essential to consider the task in hand. Some will be tempted to hack away at any old surface with these powerful grinders but certain materials, specifically wood, could easily cause the grinding disc to snag and produce the sort of kickback that would have had Michael Buerk and his 999 research team reaching for the re-enactment actors, back in the day. I generally like DeWalt's tools, and I really like the DeWalt DCG414T2-GB Cordless Angle Grinder. It boasts an incredibly powerful output for a battery-powered device, with cordless flexibility. There are also some potentially life-saving safety featurea: kick-back protection with a constant clutch and a kick-back brake system that detects wheel pinch and shuts the operation down to prevent accidents. Do be careful, now. Designed with tough daily use in mind, this grinding demigod features the world's first 18/54V convertible battery pack system, which delivers unrivalled power in the wire-free world. That means users are able to rapidly slice through steel and tackle the most demanding cutting jobs without worrying about a trip hazard or plonking themselves next to the nearest plug socket. An easy to use keyless guard system ensures it easy to make adjustments on the fly, while the clever E-Clutch and stall protection system shuts the tool down if it detects any pinch or snag in materials. The myriad professional features means it boasts a heady list price, which will likely put off those shed-based hobbyists looking for a first tool, but more serious users will love its feather-light 2.9kg mass and the long-lasting 54V XR Li-Ion battery packs. Look past the irritatingly long-winded name and you are staring at one of the most powerful cordless angle grinders on the market. If the pro-grade likes of DeWalt seem a bit full on to you, it's difficult to ignore this bargain basement offering from Guild. It offers an excellent power output and some clever features at an extremely reasonable price. Granted, we didn't subject this model to months of building site usage but it happily took on some minor polishing and metal cutting tasks without conking out or causing any problems. The safety trigger is a neat touch, as it stops it from being accidentally activated, while the two-position grab handle covers most use cases, although some rivals offer three positions. Minor niggles include the fact the safety guard requires a screwdriver to adjust and the fact that it's as noisy as a war. 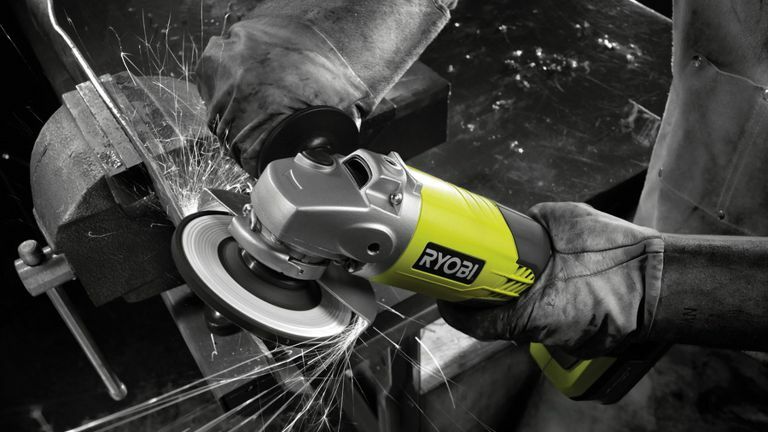 Although not as powerful as its corded cousin, this smart offering from Ryobi will happily take on most light to medium grinding jobs and does so in a very user-friendly way. The three-position handle makes it easy to squeeze into teeny spaces and use as a handy polishing device, while Ryobi's One+ battery system has proven to go the distance. One of the neatest features here is the tool-less safety guard that uses a quick release mechanism for rapid adjustments mid-way through a job. It feels slightly too underpowered to take on the chunkier cutting and grinding jobs, but it's a great addition to more shed-based metalworkers. Mr Black and Mrs Decker have done a sterling job here, balancing power output, weight and price into a prime, mid-range angle grinder. Not only does the pack come with three metal cutting discs and one specifically for slicing through stone, the die cast aluminium housing also provides great protection from drops and good heat dissipation, so no melted plastic burning through flesh to worry about. The side handle can be mounted in three positions for a comfortable grip and a 'No-volt' release switch prevents the unit from starting unintentionally when locked on. Although cheap compared with some rivals tested here, this basic model from Tacklife feels very well built and solid enough to take on serious metal and masonry cutting jobs. It comes complete with a metal cutting disc, a grinding disc and a flap disc for metal finishing work. There's also a couple of carbon brush discs for polishing up surfaces. It's a solid starter kit that should be enough to handle a load of low-key hobby tasks even if it lacks more advanced safety features.